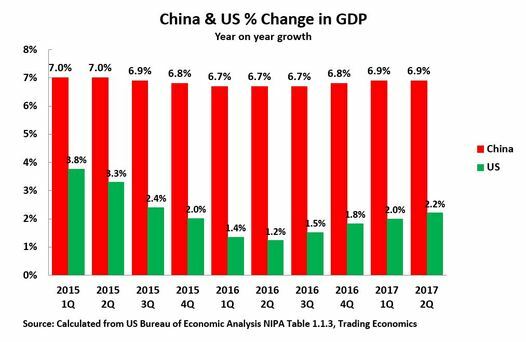 The latest US GDP figures, published on 28 September, confirm once more that China’s economy has grown more than three times as fast as the US in the last year – 6.9% in China compared to 2.2% in the US as shown in Figure 1. Even more strikingly China’s per capita GDP has grown more than four times as fast as the US – 6.4% compared to 1.5% as shown in Figure 2. ​But don’t bother to wait for corrections from those Western ‘China experts’ who were predicting a China ‘hard landing’. As always they will try to hush up their wrong predictions.